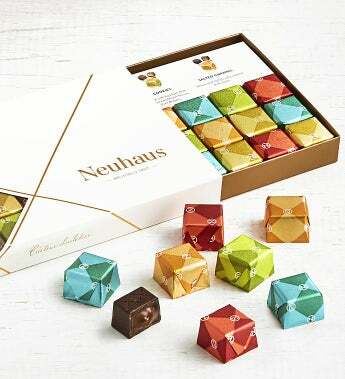 Neuhaus presents this smart, sleek, modern gift box of premium Belgian chocolates. For the Bon Bons Collection, Neuhaus's own Maître Chocolatier has created five exceptional praline flavors in milk and dark chocolate. These contemporary pieces are presented in small cubes wrapped in colorful, stylish foils. With 27 pieces, this box is perfect to share with a friend, serve at a party, or to hide it to satisfy your own chocolate cravings. Gift measures 8.75" x 4.5" x 1"